Jermain Defoe scores at the last as the Cherries gain a point in a 2-2 draw with Watford. Nathan Ake hit the crossbar early on but the hosts soon held a lead when Kiko Femenia's low effort deflected home, though Joshua King levelled from the penalty spot just before half time. 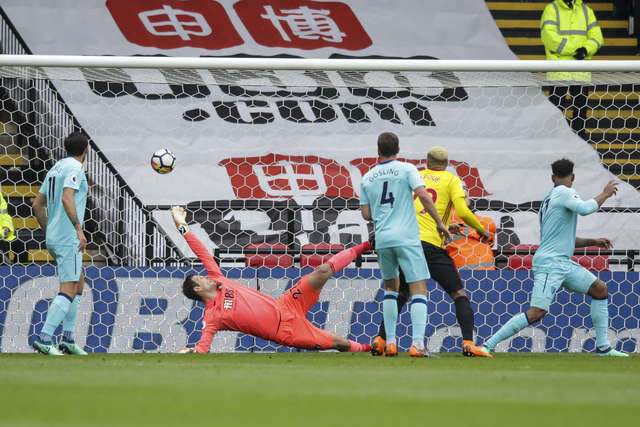 Barely was the second half under way when Roberto Pereyra scored Watford's second after the visitors had been unable to clear in the box, and following late pressure Defoe grabbed a second equaliser in dramatic fashion as he prodded home from close range in added-on time. Eddie Howe was forced into two changes for the return from the international break, Ryan Fraser and Charlie Daniels - the latter making his 100th Premier League appearance - in from the off for the injured pair Simon Francis and Adam Smith. Steve Cook led the team out as captain and four minutes in and the Cherries hit the woodwork. Junior Stanislas delivered a set piece and a diving Ake connected with the ball in the middle, the ball cannoning off the top of the crossbar. Stanislas turned goal threat three minute later, turning onto his right foot on the edge of the area and curving a shot in that forced Orestis Karnezis into a full-length diving save. It was an open start to the game and Watford grew into the contest, taking the lead on 13 minutes through Femenia. A cross delivered from a short corner found the Spanish winger, who connected with a volley, the ball taking a wicked deflection to give Asmir Begovic no chance. Shortly after though, the Cherries created another great chance when King broke through after his own interception and had just the 'keeper to beat, only for a miraculous Sebastian Prodl tackle to take the ball away from the Norwegian one on one. Play was shifting from end to end and the Hornets almost grabbed a second when a flowing move down the Watford left saw the ball rolled to Will Hughes in the centre. His scuffed finished hit Troy Deeney ahead of him and bobbled a touch wide of the target. The half was drawing to a close when there was a moment of high drama at Vicarage Road. A magnificent crossfield ball from Steve Cook found Stanislas and he created room for a shot, which was well saved by Karnezis, but with the ball still in play it was handled behind, quite deliberately, by Jose Holebas, a bizarre penalty awarded to the Cherries. The Greek international escaped with just a caution, though King ensured the Hornets were punished further, sending the 'keeper the wrong way to level the scores. Bournemouth were dealt a blow just before the break when Stanislas went down and couldn't continue, Marc Pugh coming on and taking up a role on the left flank. The two sides came back out after the half time break and Watford soon retook the lead. 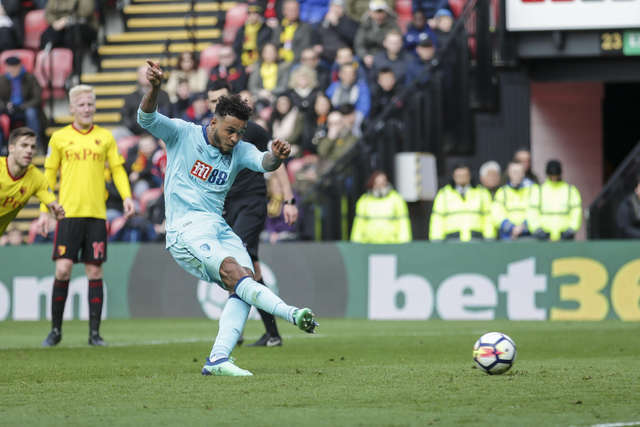 The hosts worked the ball into the penalty area with Deeney and when the Cherries were unable to intercept Pereyra managed to get to a loose ball first to wrong-foot the 'keeper with a rolled finish. Jordon Ibe stung Karnezis' hands with a shot from 22 yards, while on more than one occasion the Cherries broke with pace, only for their attack to be thwarted by an errant final ball. With 67 minutes gone, Defoe entered the game in place of Ibe, the away side switching to three at the back as they again looked for a way back into the contest. The Cherries raising the tempo and taking the home fans largely out of the game, Defoe's header from Fraser's cross needed to be tipped over by the 'keeper. Andrew Surman came on with the away side's final change, with Begovic needing to be sharp to hold onto substitute Craig Cathcart's instinctive finish from six yards out. Another promising Fraser delivery from the left almost fell perfectly for Pugh, with Surman rolling in a shot weakly from 21 yards out as the game entered added-on time. And the equaliser came in those added moments, Ake heading a set piece on and the ball dropping to the perfect man - Defoe showed brilliant composure in the box - diverting the ball home and sending the 2,000 away fans wild. The visiting support were still cheering two minutes later as the Bournemouth point was confirmed by the referee's final whistle.